day gig: Works for the City of Trussville Park And Recreation Dept. 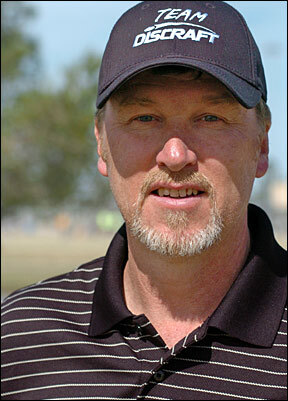 After 28 years as an Ultimate player, Tim is now focused on golf and his player rating indicates he's got the goods! That would have to be my first two NT Masters wins in 2009 (Oklahoma and Atlanta) and also winning the Alabama State Disc Golf Championships in the Open Division against a tough field. Also playing my first big tourney, the Bowling Green Open in 2000 and seeing all the top pro's in person for the first time! One more would be hitting my first ace at Brahn Springs in Huntsville, Al in 1977. I see new players just playing with one disc: a driver for everything. I would tell them to get at least one midrange and one putter and you will find your game to be more enjoyable. Also don't just play a round and go home, stay around after you get done and work on your upshots. Get a stack of your favorite midrange disc and work on those 200 to 250 foot shots. I think the upshot is way overlooked when it comes to practice. I see a lot of new players coming out to the course with discs that are way too overstable and they are throwing everything on a hyzer angle. They ask me why they can't throw it very far, and I tell them they need to start out with a less stable disc like the Surge SS and try and release the disc on a flat line. Also, be smooth on your release and don't try and over power the disc and you will see a huge gain in your distance. Putting is one of the most important parts of the game. I spend at least 30 minutes a day, sometimes more practicing. You need to work on all types of stances, you never know when you are going to be behind something and you might need to use a straddle. Or from your knee to get under a low limb. You need to putt from different distances to, I use five of the same putters when practicing. Start at 10ft and move 5ft after you make 5 putts in a row, once you get to 30ft work your way back to 10ft. Putting is all about repetition and confidence. Orlando, FL Two great courses in one park, both are fun and challenging. Huntsville, AL Long well groomed course with a couple of short shots and some hole where water and road come into play. (172 gm) Just when i thought you couldn't make a better driver, Discraft comes out with Crank! This disc is AWSOME! The Crank has added 30 to 40 feet to my distance! Very easy to throw and control. Everyone should have the Crank in their bag. (170 gm) Goes consistently farther than anything I have ever thrown. An instant game changer. (170 - 172) The Z Force is the most consistent driver I throw. My go to driver in windy conditions, also use it for big hyzer shots and S shots. (170 - 172) The Surge was one of my first big drivers I started throwing. I use this disc for tighter fairways and long straight shots. The Surge is a great driver for the beginner. (170 - 172) Great disc for wooded courses. Also, great Anhyzer. 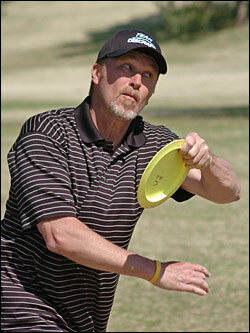 This disc helped me win the Southern National Pro Championships in Little Rock in 2009..
Great disc for 300-350' shots. Holds its line well into the wind. I use this disc also for 200-250' side arm shots. Great all around disc. Once again I went back to an old school disc, the XL. With all the new discs out now people tend to forget what a great disc this is. The XL is a nice slow controllable driver, I use it for all types of shots, hyzer, anhyzer and straight shots when I need a gentle fade at the end of its flight. Pick one up today and you to will remember what a great disc this is for your bag! (177 gm) Buzzz is probably the best midrange ever made. I use this disc for 300-350' up shots. Holds whatever line you put on it. (177 gm) The Hornet is a great midrange disc for windy conditions, you can throw it into a headwind and trust that it will not flip over on you. The more I throw it the more I'm loving it! (177 gm) I forgot what a great disc this was! The Comet is one of my favorite disc for wooded courses, It holds whatever line you throw it on. I love it for long anhyzer shots, the Comet floats forever it seems! I would say the Comet is the most controllable midrange on the market. Try one today, you will love it! (177 gm) I like to use this disc on 200-250' drives. The Hawk is slower than the Buzzz and that's why I like it. Sometimes I like my up shots to be more controlled. (177 gm) I use the Meteor for long turnover shots. This disc is under stable brand new out of the box. You'll be surprised at the distance you can get out of this disc with a Hyzer flip shot. (174 gm) The Challenger is my go-to putter. I love the feel of the D plastic in my hand. I use this putter for my putts 40' and in. I also like to use the Challenger for upshots inside of 200'. (174 gm) The Magnet is a great straight flying putter. I use The Magnet for putts between 50-100'. Also a good disc off the tee for some shorter holes.